Rapid decline in Arctic summertime sea ice extent has produced extensive seasonal ice zones, where broad marginal ice zones separate pack ice from open water. The Office of Naval Research Marginal Ice Zone program focused on the processes that control evolution of the marginal ice zone and the potential changes that may accompany increased seasonality of sea ice. The complex interplay between ice, ocean and atmospheric processes, and the potentially strong feedbacks among them, modulate sea ice melt and the transfer of momentum and buoyancy into the upper ocean. For example the influence of wind, waves and passing storms drives highly variable floe size distributions, which impact melt or formation rates of sea ice, momentum and heat transfer, light fields and phytoplankton productivity. This Special Feature presents results from the Marginal Ice Zone program, which included persistent autonomous observations of sea ice, ocean and atmosphere, extensive remote sensing and numerical investigations. British Antarctic Survey Twin Otter landing at one of the four sea ice camps. Light-weight mountaineering-style camp at instrument Cluster 3. Camps housed 2-6 people for short periods (1 - 2 days). Ice tethered profiler (foreground) and Autonomous Ocean Flux Buoy (background). British Antarctic Survey Twin Otter preparing to take off from an ice camp. Springtime deployment of an Ice Mass Balance Buoy, using helicopter support from a nearby MIZ ice camp. 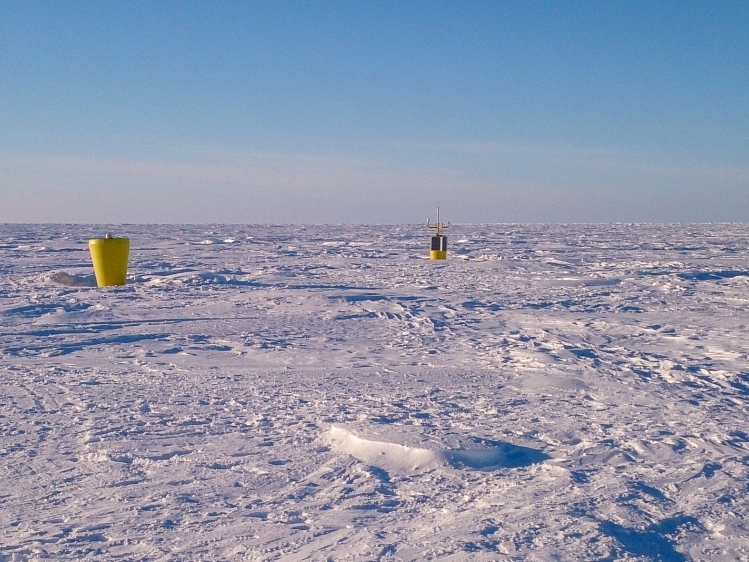 Springtime deployment of an instruments cluster: (L to R) Ice Mass Balance Buoy, Wave Buoy (with two additional instruments lying on the ice near the helicopter) and an Autonomous Weather Station. Ice Mass Balance Buoy (foreground) and Wave Buoy (background). Charging Wave Buoy batteries, with the second Twin Otter (Ken Borek Air) in the background. Configuring an Ice Mass Balance Buoy. Unloading a heavy-lift cargo flight. Seagliders and SWIFT buoys enroute from Prudhoe Bay aboard R/V Ukpik for a July deployment at the ice edge. Preparing a Seaglider for deployment from the Korean Polar Research Institute's IBRV Araon. The Beaufort Sea marginal ice zone in summer, 2014. Deploying Ice Mass Balance Buoys at the northern end of the array using a Bell Jet Ranger from teh IBRV Araon. Deploying an acoustic navigation beacon through the ice. Packing up to fly back to teh Araon at the end of a long day. Ice Tethered Profiler deployment from the Korean Polar Research Institute's IBRV Araon. The central node of the MIZ array's northernmost cluster. 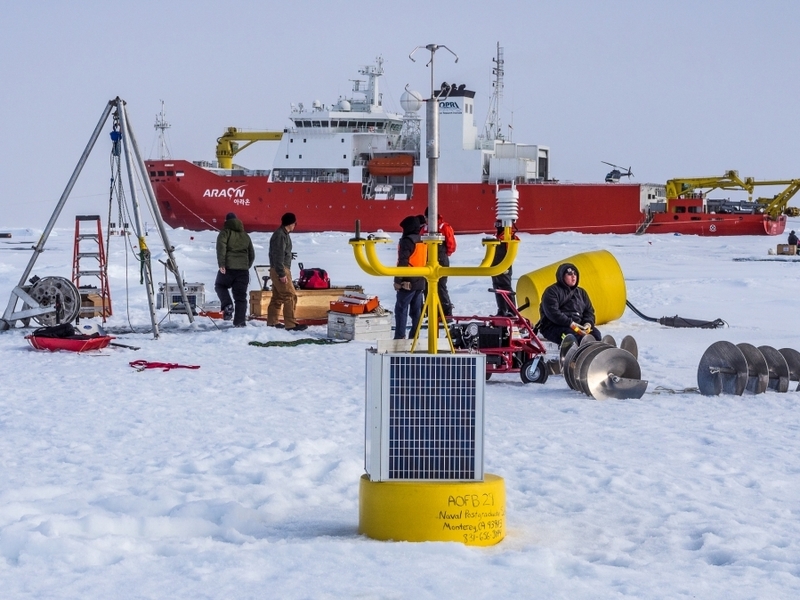 Autonomous Ocean Flux Buoy (foreground) with an Ice Tethered Profiler being deployed behind. IBRV Araon in the background. Backhauling gear following an Ice Tethered Profiler deployment. SWIFT float caught in a lead. Ice-based measurments from the IBRV Araon. Birds-eye view of the IBRV Araon in the Beaufort MIZ.